The innovatiave singlepoint sling allows decent control of the rifle when transitioning to a side arm. The muzzle must be kept in mind so that it does not hit the ground when transitioning to a kneel, crouch or other tasks low to the ground activities. The Specter Gear MOUT sling has a one inch loop which connects to a flat mount at the receiver adapter and provides a lot flexibility from the main body loop. It has a release buckle which allows the weapon to be temporarily released while still wearing the sling. Specter Gear is also producing this sling with a snap hook attachment point for those who favor that style. The Blackhawk Industries Storm Sling snaps into the receiver adapter. The separating feature of the Blackhawk Storm sling is that its body loop is partially made of bungee cord, which allows additional freedom of movement while retaining the weapon reasonably well during transitions. 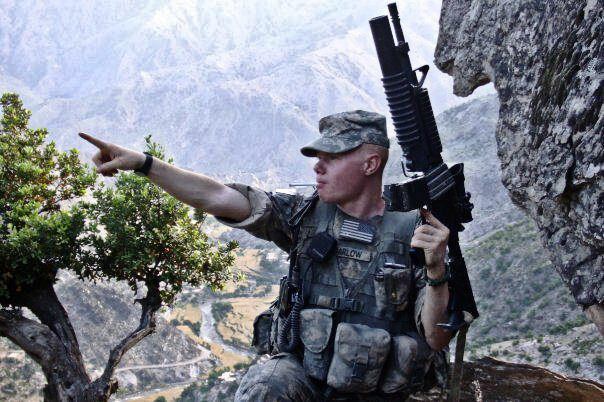 Shawn in the Korengal Valley, Kunar Province, Afghanistan. "The appearance of U.S. Department of Defense (DoD) visual information does not imply or constitute DoD endorsement."